Children are fascinated about the outer space, the shapes and sizes of the planets, diamond-like stars because it all sounds very magical. I feel it's good to learn about the solar system and planets in early days at school as it can captivate the young minds in astronomy. 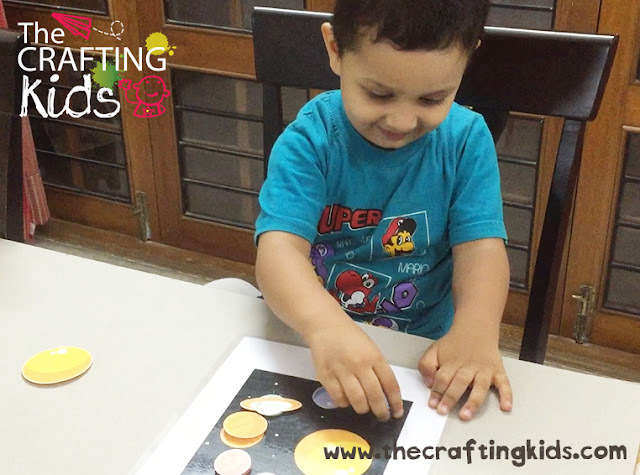 Lately, Shaunak has been showing a deep interest in learning about space and astronauts. 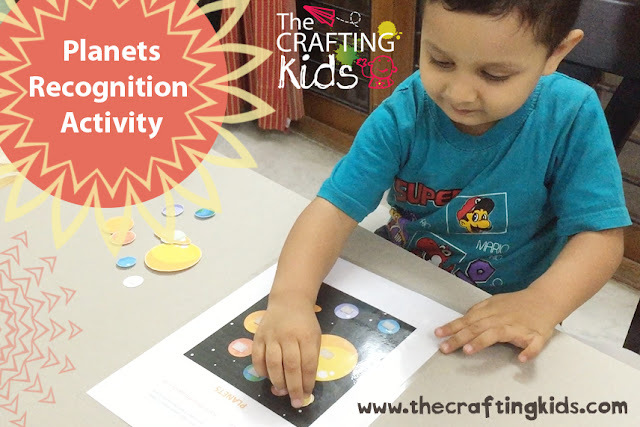 So to start with I designed this simple activity for him and he quickly did it (we have been learning about planets and their order almost since a year, so this activity was a kind of revision for Shaunak). I then put it up on Shaunak's learning wall in our living room and he is so excited about it since then. 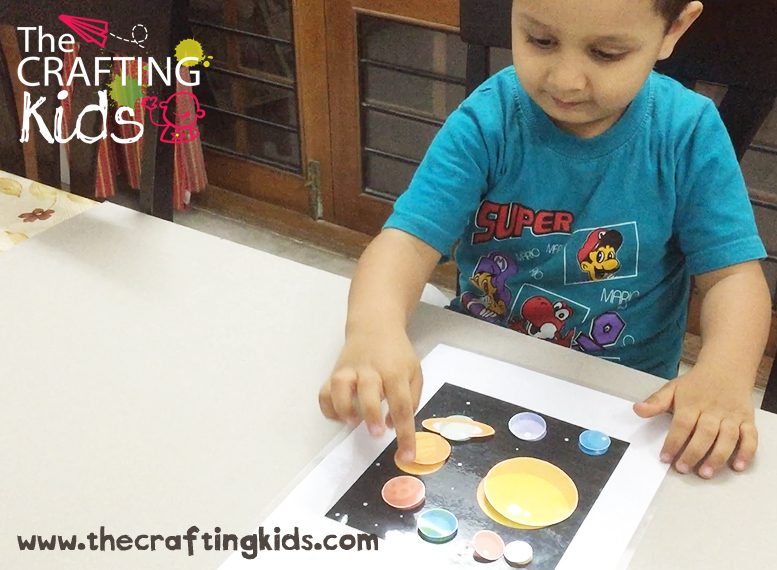 He says, "Mommy, come, I will show you the planets!". - Download FREE printable and print it. 1. Cut out each planet in round shape, on page 2. 2. 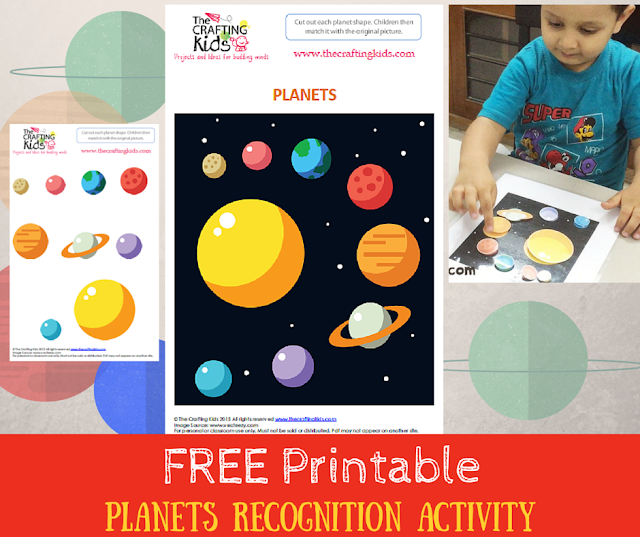 Attach a velcro dot on the planets in the printable, on page 1 and behind the cut-out planet shapes. 3. Child can then match it with the original picture. As children match the cut-out with the original picture you can ask them to say aloud the name of the planets. Its fun to remember the order of the planets starting from the smallest Mercury to farthest Neptune. It's a part of creating a baseline of knowledge. Specify that the Sun and the Moon are not the planets! I wish to do more space related activities with him in the coming days. Keep watching this space and keep in touch. DOES YOU TODDLER ADORE ANY SPACE THEMED ACTIVITY? SHARE IT WITH ME ON FACEBOOK!